It's finally here! Sneak Peek week for My Creative Time's HUGE April release! I have had so much fun playing with all of the new product, and I've only scratched the surface! For today's project, I made a 4 1/4" square card. I used a pie chart from Silhouette's Online Store to make my sunburst pattern. If you are interested in knowing how to make one of these I have a video tutorial. Now, here are the fun new goodies! How adorable is this light bulb??? 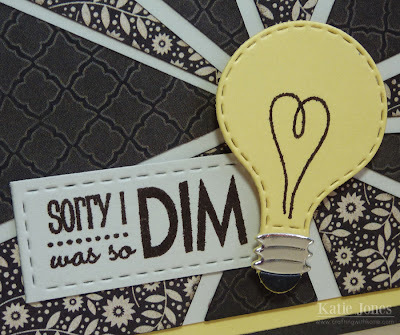 It's from the new My Creative Time You're Brilliant stamp and die set! I just adore it! It comes with layers, which allowed me to add the black and silver to the base of the bulb. The funny sentiment is also from this set. I used one of the wrapper dies from MCT's Treat Slider Box (trimmed down a bit) for my sentiment. You will have lots of fun with this set! Sweet card love the light bulb and sentiment and how clever you are to come up with the idea of the light bulb rays being sullen. You sure are one creative and talented gal. This is gorgeous. Love the pie chart/quilt pattern is what it looks like to me. I love using those treat wrappers for sentiments too. love your sun burst look! TFS! Love the sunburst style on the card. Great addition w/ the sentiment and the color choice is perfect for that. Loving the light bulb die. Very cute card! I need to learn how to do that sunburst background -- I love it. I'm going to have to check out your video tutorial. TFS! Wow...love this! I even had this file and didn't know what I'd ever do with it....I do now! Thanks Katie...great job! Beautiful card! Love the pieced paper rays and the stitching! The light bulb is so cool! Love your "rays", too. Lovely card, perfect color combo and fabulous idea to use the light bulb at the center off the "sunburst" , Thanks for sharing Katie! Love the fabulous design of this card!! I plan to have lots of fun with this stamp/die set also. I like the burst on your card background :D So pretty. Adorable, Miss Katie!!!. I just love that sunburst pattern and I'll have to come out and check out your tutorial on how you made it. I'm still such a novice with that Silhouette machine. Thanks for sharing that link. Very nice card. Love the different pattern papers on the card. Very nice. What a gorgeous card! Love the design and that light bulb is awesome!!! Love the yellow, black and white in your card. Love this new set, too! Great card! This looks like such a fun set. Love your card, love the dark colors instead of sunshine. Love this card, just so pretty. Beautiful card. Love the patterned papers! Love the sunburst technique, lots of impact on the front of a card. Looks like Emma has hit another release out of the park; can't wait to see the rest of the sneaky peaks! Katie ~ I LOVE it! I think the sunburst with those colors and that senitment go BEAUTIFULLY together! I need this paper now! EEK! I have to totally agre with you ~ we haven't even scratched the surface yet! Have a great night! Your card is wonderful! Love how you designed the pattern paper and how it makes your light bulb pop. TFS. What a cool card! I love the design of this card and I love this light bulb!! I can't wait to see some more sneaky peeks! This release looks so awesome already! Beautiful card design! The papers are gorgeous and love the fun sentiment and cute light bulb! Wow what a beautiful card!! Love your paper. Great card. I absolutely love sunburst patterns.